THROUGH OCT. 13: CRITICAL MASS 6 SOLO SHOWS. Featuring Visual Best of Show, Joshua Chambers, in the MainSpace and Literary Best of Show Artist, Katie Bickham, on the mezzanine. Artspace, 708 Texas St., Shreveport. Visit www.artspaceshreveport.com. THROUGH NOV. 30: MARJORIE GRIGONIS: CELEBRATING 50 YEARS OF CREATION. Various compositions of line, shapes and colors are used throughout the abstracts and for the artist, represent exploration, criticism, trial and error, discovery. Her feelings and thoughts influence the outcome of the work. Marlene Yu Museum, 710 Travis Street, Shreveport. Call 318-717-9111 for hours. THROUGH JAN. 11: SOME ARE POEMS. Paintings by Ellen Soffer on display. Opening reception is from 11:30 a.m. to 1 p.m., Oct. 10. The Learning Commons, Bossier Parish Community College, 6220 East Texas St., Building A, Bossier City. THROUGH JAN. 13: THE PELICAN STATE GOES TO WAR: LOUISIANA IN WWII. A historical exhibition from the National World War II Museum in New Orleans. R.W. Norton Art Gallery, 4747 Creswell Ave., Shreveport. Visit www.rwnaf.org. OCT. 8: CREATIVE ART CONNECTION MONTHLY MEETING. Multimedia artist Paige Powell will focus on her digital collages and the process involved and where she gets her source. 6-8 p.m. Bossier Arts Council, Annex, 630 Barksdale Blvd., Bossier City. Call 965-0798 or 861-3324. OCT. 11: BIZ ART SHOWING & RECEPTION. A free, family-oriented event, featuring the work of Holy Angels artists in the month of October. All original artwork displayed is for sale. 5-7 p.m. Offices of Hayter Reynolds, 9045 Ellerbe Road, Ste. 103, Shreveport. Call 698-3000. OCT. 20: SCRAWL CRAWL WRITING MARATHON. A writing marathon where participants immerse themselves in the writing process and surroundings forming small groups and sharing their way across six locations throughout the day. $25. 8:30 a.m. to 8:30 p.m. artspace, 708 Texas St., Shreveport. Call 673-6500. NOV. 8: PARTY LIKE A PRIMATE. A group exhibition featuring mixed media by local artists. Proceeds benefit Chimp Haven. Suggested $10 donation. 4-8 p.m. Nader’s Gallery, 524 East Kings Hwy., Shreveport. Visit www.chimphaven.org. THROUGH DEC. 3 MEADOWS MUSEUM OF ART FALL SHOWS. Featuring paintings by Lavar Monroe. Free. Visit website for hours. 2911 Centenary Blvd., Shreveport, LA 71104. AGAVE: No cover. Happy hour Friday and Saturday, 5 to 7 p.m. 2-for-1 well, wine & draft. Total Choice, Oct. 12,13; Side FX, Oct. 19,20; What the Funk, 8 p.m. Oct. 26, 27. Diamond Jacks Casino & Resort, 711 DiamondJacks Blvd., Bossier City. 678-7777. AMERICAN LEGION #14: Karaoke with Jay Couger, 6 p.m. every Tuesday; Karaoke with Dickie T, 6 p.m., every Sunday; Red Chute Band, Oct. 12, Nov. 9; Back Beat Boogie, Oct. 19, Nov. 16; Back When Band, Oct. 26, Nov. 23; Blue Rhythm Band, Nov. 2. 5315 Lakeshore Drive, Shreveport. 635-8186. BON TEMPS COFFEE BAR: Every Thursday from 7-10 p.m. is Thursday Night Vibes with local singers, songwriters, musicians and performers as they display their talents. Every Saturday night is poems and songs that pairs poems with smooth backing music from 7:30 to midnight. 450 Clyde Fant Memorial Parkway, Ste. 700, Shreveport. 734-9766. CANTINA BAR AT BOOMTOWN: Live music from 8 p.m. to midnight every Friday and Saturday. Pseudo Boom, Oct. 12; Jimmy Wooten Trio, Oct. 19. 300 Riverside Drive, Bossier City, La. 318-746-0711. LEGENDS THEATRE: John Michael Montgomery, 8 p.m., Oct. 19. DiamondJacks Casino & Resort, 711 Diamondjacks Blvd., Bossier City. 678-7777. MYLESTONE BAR: Mike Brown Karaoke, first and third Fridays 8 p.m. to midnight. 1920 Market St, Shreveport. 678-0700. NICKY'S MEXICAN RESTAURANT: Wayne’s FM Karaoke, 6:30-10 p.m., Thursdays. 7960 E. Texas St., Bossier City. 841-1345. NOBLE SAVAGE: Open 5 p.m.-2 a.m. Weeknight shows start at 8 p.m. On Wednesdays, Joe Nadeau's Blues Jam. Dirty Redd's Open Jam Session featuring area artists playing all-around good music every Thursday. 417 Texas St., Shreveport. 221-1781. OUR PLACE GRILL AND BAR. 5 Star Karaoke Plus with Ed Williams from 8 p.m. to midnight every Friday; Karaoke on the porch from 3-7 p.m. every Sunday. RED RIVER BREWING COMPANY: Bucket List Band, 6:30 p.m., Nov. 14, Dec. 12. 1200 Marshall St., Shreveport. 317-4110. SAM'S TAVERN: 5-Star Karaoke Plus every Friday and Saturday from 8 p.m. to midnight. Located at 3816 E. Texas Street in Bossier City. 318-658-9804. THE STAGE AT SILVER STAR: Live entertainment. Gates open at 7 p.m. unless stated otherwise. Whiskey Myers with Bishop Gun, Oct. 12; Thompson Square, Oct 19; Dylan Scott, Oct. 26; Jason Boland & the Stragglers and Cody Canada & the Departed, Nov. 16. 1201 Dixie Overland Road, Bossier City. 752-3633. Tickets available at www.outhousetickets.com. ST. CHARLES TAVERN. 5 Star Karaoke Plus featuring Ed Williams, 8 p.m. to midnight every Thursday; 5 Star Karaoke Plus hosted by Megan, 9 p.m. to 1 a.m. every Friday and Saturday. 2706 Barksdale Blvd., Bossier City. 318-210-7434. SUNDANCE CANTINA BAR AT BOOMTOWN: Live music is from 8 p.m. to midnight; 5 Star Karaoke Plus featuring Ed Williams, 7-11 p.m., every Wednesday night; 300 Riverside Drive, Bossier City, La. 318-746-0711. SUPERIOR GRILL: Live entertainment on the patio from 6:30-10:30 p.m. Jimmy Wooten Band, Oct. 10, 20; Jason Sepulvado Band, Oct. 11, 31; The Syndicate, Oct.12; Casey Martin Band, Oct. 13; Savage Trio, Oct. 17; Scram Wulfie & Lefty, Oct. 18; Tambria Adams Band, Oct. 19; What the Funk, Oct. 24; Professor Pork Chop Band, Oct. 25; The Caravan, Oct. 26; Tyler Vosbury Band, Oct 27. 6123 Line Ave., Shreveport. 869-3243..
TIKI BAR: Live music at 6:30 p.m. Hunter Brabham Williams and Deaton, Nov. 28, Dec. 19; Bucket List, Nov. 7, 21, Dec. 5, 26. 639 E. Kings Highway, Shreveport. 868-6355. TREJOS MEXICAN RESTAURANT: Wayne’s FM Karaoke, 6-10 p.m. Fridays. 5795 N. Market, Shreveport. 929-0299. TWISTED ROOT BOSSIER: Friday Nights at the Root, 7-9 p.m. on the patio, Holly Tucker, Oct. 12; Morgan Ashley, Oct. 19; Nick Sterling, Oct. 26; Austin Upchurch, Nov. 2; Mitchell Ferguson, Nov. 9; David Adam Byrnes, Nov. 16; Tyler Dudley, Nov. 23. 2578 Airline Drive, Bossier City. WHAT'S ON TAP: Happy hour daily 7 a.m. to 7 p.m. 33 beers on tap. 1207 Shreveport-Barksdale Hwy., Shreveport. 869-2422. WHAT'S ON TAP II: Happy hour daily 11 a.m. to 7 p.m. Serving food and 23 beers on tap. 2369 Airline Drive, Bossier City. 747-5505. WHISKEY ROADHOUSE: Hours are noon to midnight Sunday; 6 p.m. to midnight Monday through Thursday; 4 p.m. to 2 a.m. Fridays and Saturdays. Karaoke from 8 p.m. to midnight every Tuesday. Horseshoe Casino, 711 Horseshoe Blvd., Bossier City. WANT TO GET YOUR EVENT, BAND OR BAR/NIGHTCLUB LISTED IN “TALK OF THE TOWN”? E-MAIL INFORMATION THREE WEEKS PRIOR TO THE EVENT DATE TO EDITOR@THEFORUMNEWS.COM. OCT. 19: JOHN MICHAEL MONTGOMERY. American country singer hits the stage in Bossier City. Tickets start at $40. 8 p.m. Legends Theatre, DiamondJacks Casino & Resort, 711 Diamondjacks Blvd., Bossier City. Visit www.ticketmaster.com. OCT. 20: RBRM (RONNIE, BOBBY, RICKY AND MIKE!). Tickets on sale now. 7:30 p.m. CenturyLink Center, 2000 CenturyLink Center Drive, Bossier City. Visit www.ticketmaster.com. OCT. 26: TURNPIKE TROUBADOURS. With special guest Stoney LaRue. 7:30 p.m. CenturyLink Center, 2000 CenturyLink Center Drive, Bossier City. Visit www.ticketmaster.com. NOV. 3: MARTINA MCBRIDE. Tickets on sale now. Tickets start at $65. 8 p.m. Margaritaville Resort Casino, 777 Margaritaville Way, Bossier City. Visit www.ticketmaster.com. NOV. 18: TOBYMAC & DIVERSECITY BAND. With special guest Ryan Stevenson in this one-of-a-kind concert experience. Reserved seating. $20-$99.50. 7 p.m. Shreveport Municipal Auditorium, 705 Elvis Presley Ave., Shreveport. Visit www.shreveportmunicipalauditorium.com. DEC. 8: THE JAMES BURTON CHRISTMAS CONCERT: MEMORIES OF ELVIS. With music from James Burton, Estelle Brown and other special guests singing Christmas music, a tribute to Elvis and more. $30. 8 p.m. Paradise Theatre, Margaritaville Resort Casino, 777 Margaritaville Way, Bossier City. Visit www.ticketmaster.com. DEC. 9: THE HUMAN BEING TOUR WITH JOHN CRIST. Tickets on sale now. General admission. $20, $25, $40, $75, $150. 7:30 p.m. Shreveport Convention Center, 400 Caddo St., Shreveport. Visit www.ticketmaster.com. DEC. 13-16: WRONG NOTE RIGHT: THE STORY OF AN ACCIDENTAL PIANO MAN. Join us for a special evening of theatrical and musical adventure as storyteller and award-winning piano entertainer Winston Hall shares the colorful tale of his unlikely rise as one of North Louisiana’s most popular performers. $20. 7:30 p.m.; 2:30 p.m., Dec. 16. East Bank Theatre, 630 Barskdale Blvd., Bossier City. Visit www.eventbrite.com. DEC. 14: CHAD PRATHER. On his “Star Spangled Banter” comedy tour. $32.50-$26.75. Reserved seating. Ages 18 and older. 8 p.m. Shreveport Municipal Auditorium, 705 Elvis Presley Ave., Shreveport. Visit www.shreveportmunicipalauditorium.com. DEC. 16: HARRY CONNICK JR. Performs his “A New Orleans Tricentennial Celebration … Holiday Edition.” $49.50, $69.50, $89.50, $119.50. 7:30 p.m. Shreveport Municipal Auditorium, 705 Elvis Presley Ave., Shreveport. Visit www.shreveportmunicipalauditorium.com. DEC. 26: MANNHEIM STEAMROLLER CHRISTMAS. By Chip Davis. $79.50; $59.50; $39.50. Reserved seating. All ages must have a ticket. 8 p.m. Shreveport Municipal Auditorium, 705 Elvis Presley Ave., Shreveport. Visit www.shreveportmunicipalauditorium.com. JAN. 22: THE BEACH BOYS: NOW & THEN. Tickets on sale now. Reserved seating. $50, $68, $86. 7 p.m. Shreveport Municipal Auditorium, 705 Elvis Presley Ave., Shreveport. Visit www.shreveportmunicipalauditorium.com. OCT. 11-14, 18-21: ONCE ON THIS ISLAND. A musical based on the retellings of Hans Christian Andersen’s “The Little Mermaid” presented by the Cavalier Players. For teenage and older audiences. 7:30 p.m., Oct. 11-14, 18-21, 2 p.m., Sunday performances. $15. Season memberships are on sale now. Bossier Parish Community College, 6220 East Texas St., Bossier City. Call 678-6525. 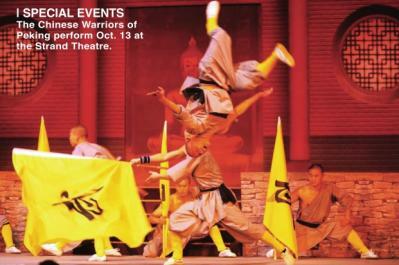 OCT. 13: CHINESE WARRIORS OF PEKING. This new production is filled with high-intensity martial arts and breath-taking acrobatics to tell the tale of two rival martial arts disciplines competing in Peking. $25, student; $27; $35; $45. 8 p.m. The Strand Theatre, 619 Louisiana Ave., Shreveport. Visit www.thestrandtheatre.com. OCT. 21: JERSEY BOYS. This is the story of Frankie Valli and the Four Seasons in the Tony Awardwinning phenomenon. $25, student; $46; $61; $75. 7 p.m. The Strand Theatre, 619 Louisiana Ave., Shreveport. Visit www.thestrandtheatre.com. NOV. 8-11: DISNEY’S ALADDIN JR. The story you know and love has been given the royal treatment. $18, $15, students in advance. 6 p.m., Nov. 8, 9, 10; 11 a.m., Nov. 10; 2 p.m., Nov. 10; 3 p.m., Nov. 11. Emmett Hook Center, 550 Common St., Shreveport. Call 218-9978. EVERY SATURDAY THROUGH NOV.: BOSSIER CITY FARMERS' MARKET. With fresh fruits and vegetables, honey, jams and jellies, makers, hobbyists, handmade soap, baked goods, food trucks and more. Free. 9 a.m. to 1 p.m. Pierre Bossier Mall, 2950 E. Texas Ave., Bossier City. Visit www.BossierCityFarmersMarket.com. THROUGH OCT. 30: PROVENANCE PUMPKIN PATCH. A month-long event with hayrides, movie nights, crafts, photo sessions and much more hosted by The Junior League of Shreveport-Bossier Inc. 3:30-6:30 p.m., Monday through Friday; 10:30 a.m. to 6:30 p.m., Saturday and Sunday. Provenance, 1968 Bridgewater Ave., Shreveport. Visit www.yourprovenance.com. OCT. 11: FASHION NIGHT OUT! Two fashion events honoring retail icon Knox Goodman. Professional models by the Michael Turney Agency will share the latest looks and will include surprise celebrity models. $85 for main floor, $75 for balcony. 11:30 a.m., luncheon; 6-9 p.m., evening show and cocktails. Scottish Rite Cathedral, 755 Cotton St. Call 221-2628 or visit eventbrite.com. OCT. 11: OKTOBERFEST CRAFTS AND CRAFT BEER NIGHT. Buckle your lederhosen and let us pour you a bier. This round of crafts and craft beer is centered around the German holiday known as Oktoberfest, where attendees personalize a beer mug with paints while tasting pints. $30. 5:30-8 p.m. artspace, 708 Texas St., Shreveport. Visit www.artspaceshreveport.com. OCT. 11: DARKNESS TO LIGHT’S STEWARDS OF CHILDREN WORKSHOP. This two-hour event equips attendees to first recognize sexual abuse and respond appropriately. Free. 6-8 p.m. Hamilton/ South Caddo Library, 2111 Bert Kouns, Shreveport. Visit www.pcal.org. OCT. 11: TEA AND COFFEE. A presentation from Donna Curtis on Shreveport Green’s work in environmental issues in the area. 2 p.m., tea and coffee; 2:30 program. Women’s Department Club, 802 Margaret Place, Shreveport. Call 222-4186. OCT. 11, 18, 25: MARKETS & MUSIC. Fresh produce, outdoor concert and good eats. Live music by Cory Cross, Oct. 11; Professor Pork Chop, Oct. 19; Ben Marshal, Oct. 25. 5-8 p.m. Windrush Park, 1968 Bridgewater Ave., Shreveport. Visit www.yourprovenance.com. OCT. 12: KREWE OF HIGHLAND CORONATION XXIV. An outdoor extravaganza of carnival games, circus treats, sideshow acts and a silent auction of Highland treasures. Cash bar. $40. 7 p.m., doors open; 8 p.m., presentation of royal court. Pine Wold, 2745 Fairfield Ave., Shreveport. Email captainofhighland@gmail.com. OCT. 12-14: PAW PATROL LIVE: RACE TO THE RESCUE. The top-rated animated preschool series returns with four performances. 6 p.m., Oct. 12; 10 a.m., 2 p.m., Oct. 13; 2 p.m., Oct. 14. CenturyLink Center, 2000 CenturyLink Drive, Bossier City. Tickets on sale at www.ticketmaster.com. OCT. 13: ARK-LA-TEX GENEALOGICAL ASSOCIATION MONTHLY MEETING. With guest speakers Kathryn Benson and Glenn Moore. Free. 1-3 p.m. Shreve Memorial Library, Broadmoor Branch, 1212 Captain Shreve Drive, Shreveport. Visit www.altgenealogy. com or call 746-1851. OCT. 13: LIP SYNC BATTLE. Families Helping Families host the inaugural event with local community leaders showcasing their best impersonation. Cocktail attire with food and cash bar. Must be 21. $35. 6-9 p.m., Shreveport Convention Center, 400 Caddo St., Shreveport. Visit www.eventbrite.com. OCT. 14: FAMILY FALL FEST, MOVIE NIGHT AND WEINER DOG RACES. With local food trucks, bounce houses, face-painting, petting zoo, weiner dog races, cult classic movie “Hocus Pocus” and more. 3 p.m. Harrah’s Louisiana Downs, 8000 E. Texas St., Bossier City. OCT. 17: THE CITY CHAMPIONSHIPS EXHIBITION #1. Featuring eight quarterfinalists from this year’s City Championship and singles matches with two of the young players. 6:30-9:30 p.m. Southern Hills Tennis Center, 1000 W. Bert Kouns Ind. Loop, Shreveport. Visit the Facebook event page at www.facebook.com. OCT. 18: OCTOBER BOOK REVIEW AND LUNCHEON. With Hannah Hoan, author of “A Gift A Brain.” 10:30 a.m., social; 11 a.m., book review; noon, lunch. $15. Women’s Department Club, 802 Margaret Place, Shreveport. Call 222-4186. OCT. 18-28: 21ST ANNUAL SHOPPER’S CARD. Save 20% off at your favorite local merchants by purchasing this card and all proceeds will go to Shreveport Symphony Orchestra. Call 222-7496 or visit www.ShreveportSymphonyGuild.org. OCT. 19: TWILIGHT TALKIES: THE GREATEST SHOWMAN. Enjoy a movie on the lawn of the museum for free. Bring chairs and blankets and local food trucks will have food for sale. 7 p.m.; 8 p.m., movie. R.W. Norton Art Gallery, 4747 Creswell Ave., Shreveport. Visit www.fwnaf.org. OCT. 19: DAVID AND TAMELA MANN. Tickets on sale now. Reserved seating. $24.50-$59.50. 7 p.m. Shreveport Municipal Auditorium, 705 Elvis Presley Ave., Shreveport. Visit www.shreveportmunicipalauditorium.com. OCT. 19-20: 4TH ANNUAL LOUISIANA JET RALLY. An aerial event for hobbyists and modelers who like to make big radio-controlled airplanes and fly them for fun and to showcase specific types of airplanes. Free for spectators. $35 for pilots. C.E. “Rusty” Williams Airport, 211 Independent Ave., Grand Cane. Call 470-2650 or 871-8900. OCT. 20: BOSSIER CITY MAKERS FAIR. Shop with over 100 local makers and artists from around the Ark-La-Tex with live entertainment, food, activities for kids and more. 10 a.m. to 6 p.m. Louisiana Boardwalk, 540 Boardwalk Blvd., Bossier City. Visit www.BossierCityMakersFair.com. OCT. 20: CRUISIN’ IN GRAND CANE. Antique, classic and street rod car and tractor show. Food, music, door prizes and car trivia with prizes. 9 a.m. to noon. Grand Cane, La. Call 858-2556. 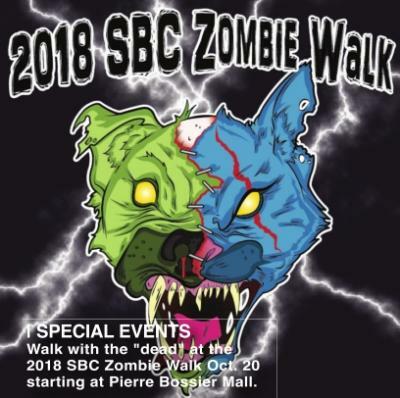 OCT. 20: SBC ZOMBIE WALK: Free family event with zombie costumes, artists, jewelry, food, door prizes and more. Pet friendly. 4-9 p.m. Pierre Bossier Mall, 2950 E. Texas St., Bossier City. Visit www.facebook.com. OCT. 21: SCCA AUTOCROSS EVENT This is a precision driving competition that pits one car at a time against the clock, and against others in your same class, to see how quickly you can negotiate your way around an orange pylon-marked course without hitting any cones or missing any gates. $40 for novices and SCAA members; $50 for experienced and non-SCAA members. No charge for non-competitors. 8-9 a.m. is registration and tech inspection. Thunder Road Raceway, 5700 Thunder Road, Gilliam. Call 687-1507. OCT. 23: PUMPKIN SHINE ON LINE. With decorated pumpkins on display from schools, churches, business and individuals, food trucks, carnival style kids' play area and music. A free shuttle is available at Mall St. Vincent from 4-9 p.m. 4:30-8:30 p.m. Betty Virginia Park, 3901 Fairfield Ave., Shreveport. OCT. 23: PARTNERS IN PREVENTION. The annual Gingerbread House fund-raiser luncheon featuring keynote speaker, abuse victim and author Dave Pelzer. $125. Noon. Horseshoe Casino & Hotel, 711 Horseshoe Blvd., Bossier City. Visit www.gingerbreadhouseac.org. OCT. 25-27, 28, 31: HAUNTED TOURS OF SHREVEPORT MUNICIPAL AUDITORIUM. 90 minute tours of one of the most haunted places in north Louisiana. $20; must purchase online. 6:30 p.m., Oct. 25,27,31; 8:30 p.m., Oct. 27; 2 p.m., Oct. 28. Shreveport Municipal Auditorium, 705 Elvis Presley Ave., Shreveport. Visit www.shreveportmunicipalauditorium.com. OCT. 26-27: ANTIQUES & ARTS FAIR 2018. Enjoy early Christmas shopping and retail therapy with furniture, jewelry, vintage Christmas decor, candles and much more. 9 a.m. to 4 p.m. Women’s Department Club, 802 Margaret Place, Shreveport. Call 222-4186. OCT. 27: MASTER GARDENER FALL BULB SALE. Annual sale with over 5,000 heirloom bulbs for sale. 8 a.m. to noon. Randle T. Moore Center, 3101 Fairfield Ave., Shreveport. Call 698-0010. 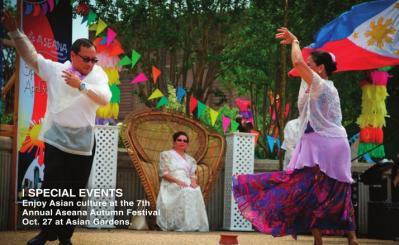 OCT. 27: 7TH ANNUAL ASEANA AUTUMN FESTIVAL. A free, family-friendly event celebrating Asian culture through food, dance, music and more. 4:30 p.m.; 7 p.m., fireworks. Asian Gardens, 800 Texas Ave., Shreveport. NOV. 2: PROHIBITION PARTY. With music from Bull Causey Orchestra, food by Chef Anthony Felan, a cash bar and more. 1920’s cocktail attire is encouraged. $75. 7-10 p.m. Flying Heart Brewery, 700 Barksdale Blvd., Bossier City. Visit www.eventbrite.com. NOV. 2-3: MISSION MARKETPLACE. An annual event where Shreveport churches join together to put on a fair-trade Mission Marketplace. $10 for preview from 7-8:30 p.m., Nov. 2. Free admission from 10 a.m. to 2 p.m. Nov. 3. Broadmoor United Methodist Church, 3715 Youree Drive, Shreveport. NOV. 3: 2ND ANNUAL SHREVEPORT SOUNDS: A MUSIC HISTORY SYMPOSIUM. This event highlights the history of North Louisiana’s various decades of music and musicians with lectures, open discussions, films and musical performances. $60. 9 a.m. to 3 p.m. Robinson Film Center, 617 Texas St., Shreveport. Visit www.eventbrite.com. NOV. 3: ART IN THE PARK. Annual nature and wildlife art show and sale with local artists and live music, food vendors and more. Noon to 4 p.m. Walter B. Jacobs Memorial Nature Park, 8012 Blanchard Furrh Road, Shreveport. Visit www.caddo.org or call 929-2806. NOV. 5: PLANTS OF THE CADDO INDIANS. Learn from Daniel Mills about common plants used locally by the Caddo Indians for food, medicine and wares. Ages 8 and up. Bossier Parish Libraries History Center, 2206 Beckett St., Bossier City. Call 7465-7717. NOV. 7: LOYOLA STYLE SHOW. Annual luncheon fund-raiser for Loyola College Prep where seniors wear clothes from local shops. 11 a.m. to 1 p.m. Shreveport Convention Center, 400 Caddo St., Shreveport. NOV. 9-11: BAYOU RENEGADE RALLY. A special event with approximately 250-500 motorcycle enthusiasts expected to participate. The rally will span multiple dates and includes a progressive poker run from Shreveport to Lake Charles. 9 a.m. Sam’s Town Hotel & Casino, 315 Clyde Fant Parkway, Shreveport. Visit www.bayourenegaderally.com. NOV. 10: MIDWAY TO MARDI GRAS 5K “RUN FOR THE BEADS.” Krewe of Justinian XXV hosts this annual 5K and Fun Run and the first 300 finishers receive a specialty bead. 7:30 a.m., Fun Run; 8 a.m., 5K. Rhino Coffee, 721 Southfield Road, Shreveport. $25 through Nov. 9; $35 day of. Visit www.sportspectrumusa.com. NOV. 10: INDIA NIGHT 2018. Featuring a dance recital in the folk tradition representing the diverse regions of India along with cocktails, appetizers and dinner. 5:30 p.m. LSUS University Center, One University Place, Shreveport. Call 797-5257 or visit www.eventbrite.com. NOV. 15-18: LES BOUTIQUES DE NOEL: Annual shopping event to benefit the Shreveport-Bossier Opera Guild. $10 daily tickets. Bossier Civic Center, 620 Benton Road, Bossier City. Visit www.facebook.com. BOOMTOWN CASINO & HOTEL: 300 Riverside Drive, Bossier City, 746-0711. www.boomtownbossier.com.October Promotions: $50,000 Potion Punch is every Friday. With up to $2,500 in bonus rewards. Five winners every 30 minutes. Drawings from 7-10 p.m. Pick a Pumpkin Kiosk Game is 1-4 p.m., Sundays and 5-9 p.m. Wednesdays. Everyone is a guaranteed winner. Swipe your mychoice card at any mychoice kiosk to reveal your prize. DIAMONDJACKS CASINO & RESORT: 711 Diamondjacks Blvd., Bossier City. 678-7777.See Rewards Club for details. Restrictions apply. New Member. Receive up to a $100 refund in the mail. Mail offer based on play. Happy Birthday. Come in on your birthday, swipe your Rewards Club card and receive a present from us. October Promotions: $75 K Spooktacular Sweepstakes. Win a share of $75K in slot play, gift cards and a fall getaway. Drawings from 7-11 p.m. every Friday and Saturday. Pumpkin Power Swipe & Win is from noon to 6 p.m. every Tuesday. Win treats, slot play, cash, points and more! Gift Day Rewins is from noon to 6 p.m on Oct. 10,17,24 with a chance to receive past gifts with 10 slot plays. 50+ Diamond Club is every Thursday. 10X Points is from 5-7 p.m. every Friday. Submit your email to the Rewards Club for a chance to win a share of $500! Halloween Jack O’ Play is from noon to 6 p.m., Oct. 31. Win up to $500 in slot play! LEGENDS BUFFET SPECIALS: Salute to our troops. 25% off every day at Legends Buffet. Must have military I.D. to receive discount. Not valid on holidays. Cannot be combined with any other offer. Seafood Buffet is Friday, $24.99 with Rewards Card. Prime rib and shrimp buffet, $24.99 Saturday nights with Rewards Card. Prime Rib & Shrimp Buffet is $24.99 with Rewards Club card on Saturday. ELDORADO RESORT CASINO: 451 Clyde Fant Parkway, Shreveport. 877- 602-0711. HARRAH'S LOUISIANA DOWNS: 8000 E. Texas St., Bossier City. 742-5555. Must be 21 years of age or older to participate. Daily Racing Promotions. The 2018 Live Racing schedule runs Saturday, Monday, Tuesday and Wednesday, daily post time 3:15 p.m. Race reward Credit Multiplier. On Saturdays, make your wager with your Total Rewards Card to receive your Reward Credit multiplier. DARE DAYCLUB: Dare is open daily to the public from 11 a.m. to 9 p.m. Admission is $5 at the gate. Must be 21 years old to enter. Party poolside on Splash Saturdays w/DJ Dayton & Sunday Fundays w/DJ Love from 4-9 p.m.
MARGARITAVILLE CASINO AND RESORT: 777 Margaritaville Way, Bossier City. 855-346-2489. www.margaritavillebossiercity.com. October Promotions: Margaritaville Millions Continuity Game. Island-themed game is every day. Play N’ Get Wine Series is every Monday. 2x Play Wednesdays where guests receive two free game plays on Wednesdays only. $100K Progressive Grand Fortune Giveaway is Oct. 19, 20 and 21 where one winner will walk away with $10,000 in cash and any free play that was not redeemed in previous drawings. Sunday & Wednesday is $35K Mini Baccarat Hot Seat with drawings from 8-11 p.m. Two names will be drawn every 15 minutes for $200 in promotional chips. All Access members will receive $400. SAM'S TOWN HOTEL AND CASINO SHREVEPORT: 315 Clyde Fant Parkway, Shreveport. 811-429-0711. www.samstown.com.